Famous for As close as you’ll get to a real MotoGP bike. Sitting on the thinly-padded racing seat of an RCV, surrounded by serious-looking faces in HRC polo shirts in a sun-drenched Valencia pitlane, I can’t help but think I’ve been here before. Good fortune and the plum job of MCN road tester gifted me a ride on Nicky Hayden’s 990cc RC211V in 2006 and his 800cc RC212V the year after at this Spanish track. But now here we are on the latest version: the RC213V. Of course that’s not strictly true. 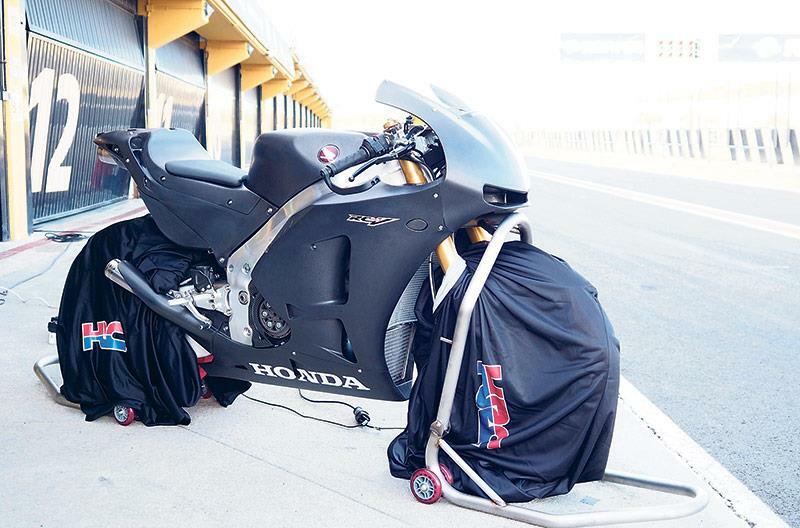 This is the £137,000 Honda RC213V-S, the street version of Honda’s glittering MotoGP machine. But it feels just the same. It’s a limited-edition, once-in-a-lifetime special and only 250 examples will be made, between now and the end of 2016. 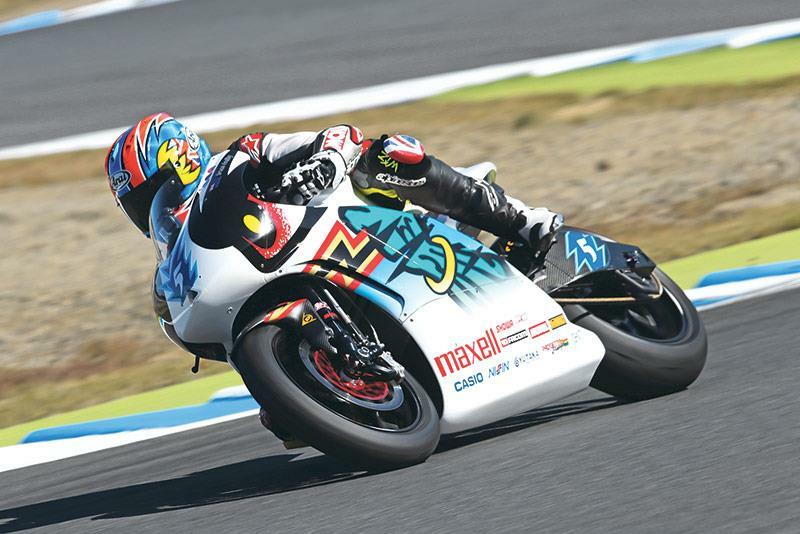 MotoGP teams pulled the handbrake on the end-of-season press test rides in 2007, so the RC213V-S is the closest anyone outside of the MotoGP paddock will ever get to riding the real thing. But that’s OK because this Honda isn’t exactly a million miles away from Marc and Dani’s, especially with the £8000 Sports Kit fitted. Making 215bhp and weighing just 160kg, the RC213V-S looks to all the world like Honda’s MotoGP missile, and with the racket of its straight-through, 116db titanium exhaust frying your brain and spitting V4 blood on the overrun, it sounds like it, too. 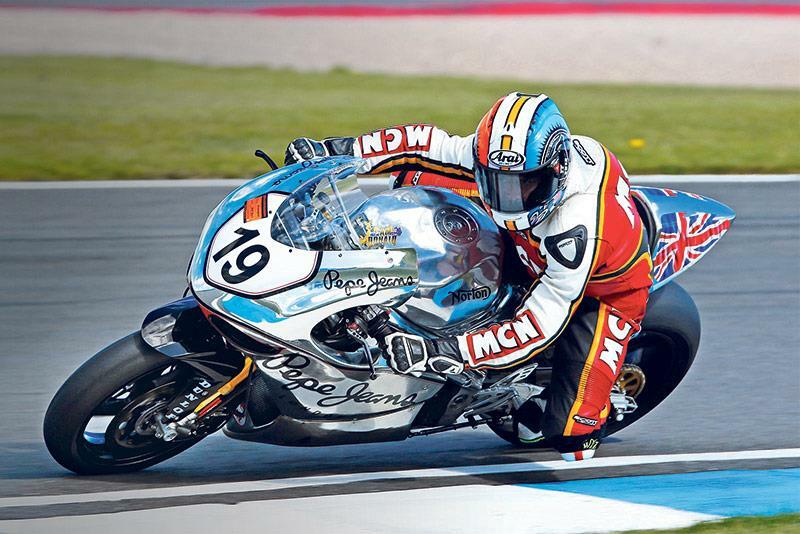 The RC213V-S is a riot of magnesium, titanium, ally and steel, swathed in carbon-fibre. It wears top-spec Öhlins, Brembos, and Marchesini magnesium rims shod with sticky Bridgestone V02 slicks. It shares most of its components with the racer, like the chassis, which is made by Moriwaki and assembled by HRC magicians. Lots of the engine internals, like the hollowed-out cams, manufactured by Mugen, are the same, too. Aside from the factory machine’s seamless gearbox and pneumatic valves, the RC213V-S duplicates the racer and is even more like last year’s RCV1000R open-class bike. That angry exhaust might put the fear of god into you as you climb aboard, but the thing about the RC213V-S is it’s actually easy to ride. That 999cc V4 motor, which has the same physical dimensions as the 800cc RC212V racer, spews smooth, linear power, controlled with a buttery-smooth and precise throttle. The Honda V4 delivers its speed deceptively, but never before have the straights between the corners of your favourite track, been so short. It’s impossible to get the RC213V-S to misbehave, no matter how hard you push. Corner as fast as you dare, wince as you accelerate and brake so hard the rear wheel floats above the tarmac, yet the Honda doesn’t flinch. You realise this bike has been built for the best riders in the world to play on and it has reserves of performance mere mortals will never get to experience. That said, the chassis still talks to you at numpty speeds, you can feel the Bridgestone slicks digging into the tarmac and you can enjoy the sheer decadence of Honda’s masterpiece V4 motor. And that’s the magic of the RC213V-S. But with them all sold out already, it will probably be easier getting a go on the real thing. The Shinden is special: a money-no-object racing machine, built to win an electric TT and make the world sit up and take notice. With its carbon-fibre beam frame, swingarm and bodywork, magnesium wheels and engine cases, factory-spec Showa suspension and Nissin brakes, it’s a work of art. 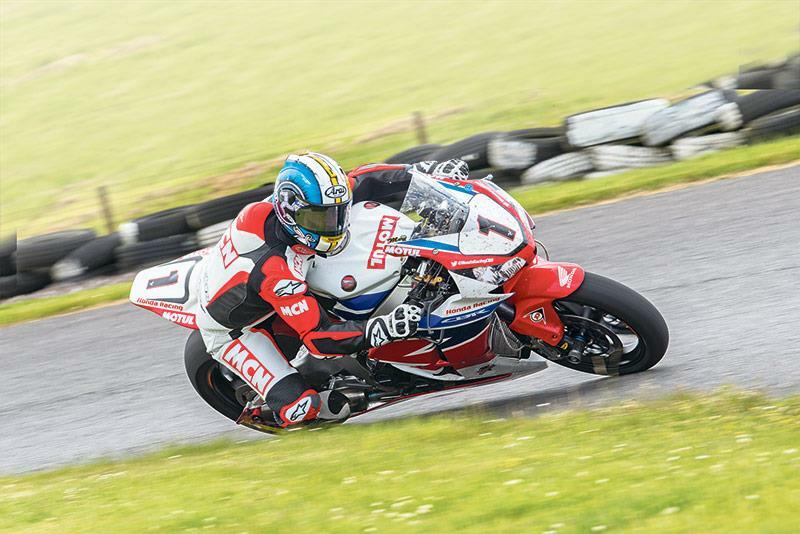 The 2015 Shinden Yon (Japanese for ‘four’) is still weighty and busts the scales at 250kg, but it now has 148bhp and tops out at 168mph at the TT – faster than the first flying lap of the best TT Lightweights. Out on track the Shinden acts like the world’s fastest twist-and-go. There’s an ocean of linear torque at your right wrist, delivered smoothly with the kind of flawless response we all lust after from an engine. Acceleration is on par with a racy 600 or a road-going GSX-R750, even on its ultra-tall TT gearing. There’s no time wasted clicking through gears, just pin the throttle to the stop and the Shinden fires relentlessly from corner to corner. Being so heavy it lacks some of the rear tyre-squirming, front-wheel-lifting drama you get from a conventional superbike, but I still came back into the pits with a sweat-on, a big smile on my face and a new-found admiration for electric power. 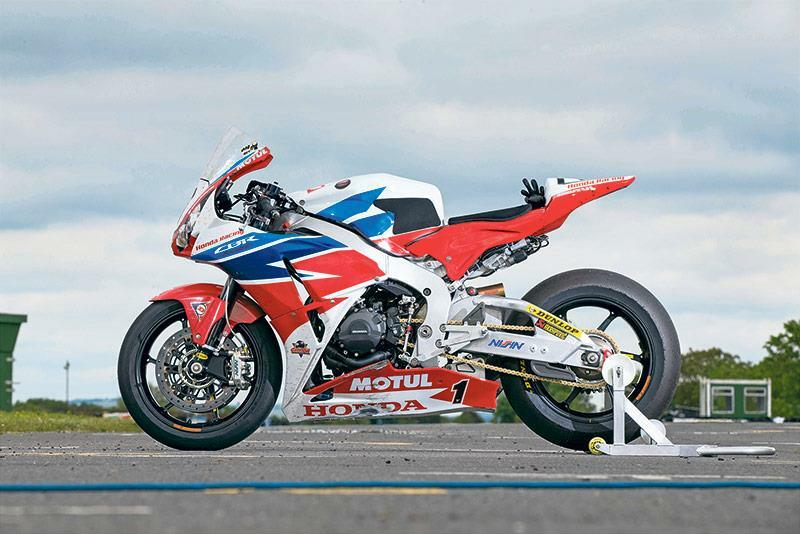 This Honda Racing CBR1000RR took a dramatic Senior race win at the TT in the hands of 23-times TT winner John McGuinness, and set a new outright lap record of 132.701mph. It is the fastest road bike in the world! Creating a Senior winner takes years of dedication, knowledge and craftsmanship. This is a bike without clever electronics – its speed comes from elsewhere. First it makes its rider comfortable. The bars are wide, so are the footpegs, the 24-litre fuel tank, which extends under the seat, feels huge. The fairing is wide and the screen is tall, 50mm higher than normal, making it feel like a sports tourer. The clocks are near standard, there’s familiar Honda switchgear, and if it weren’t for the trick thumb brake you’d never guess you were on a race bike. Secondly, it’s stable. The front is raised, the rear is lowered, slowing the steering and increasing stability, which is important at the TT but not ideal for a short circuit. At low speed it’s almost lazy. The suspension is plush, not harsh like a short circuit racer. It doesn’t even want to wheelie. But as your speed increases it begins to make sense. Honda have made all the horsepower usable, nothing goes to waste. That’s what wins the Senior TT. With a top speed of over 200mph, this is the fastest Norton to ever lap the TT. It's a fire-breathing V4 superbike with bite. Second in this year's WSB championship, we reckon Chaz has balls the size of coconuts to keep hold of this animal!